Alec White celebrates his state championship. Alec White capped his New Palestine High School wrestling career with a quick move and a sudden victory. 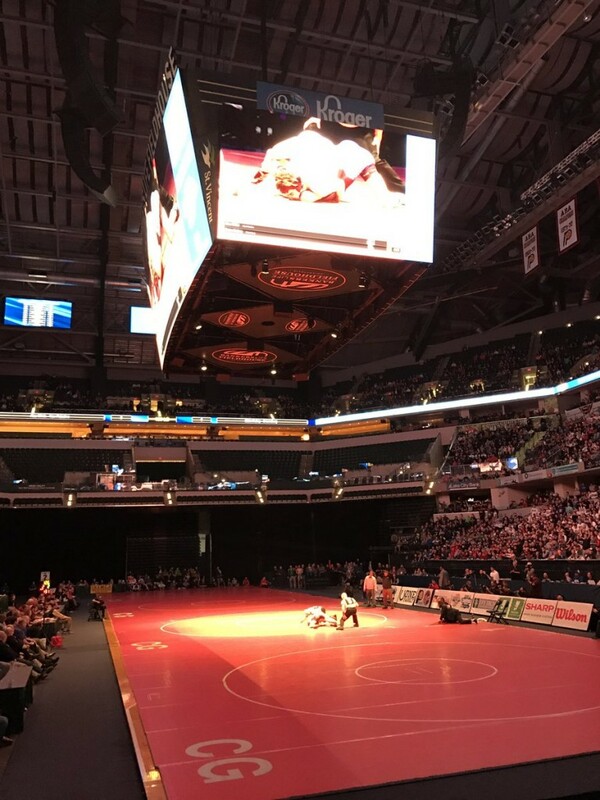 The senior claimed the 126-pound IHSAA state championship Saturday night, pinning Brownsburg’s Blake Mulkey in 3:32. The two wrestled through a scoreless first period and White had the down position in the second. The two were tied at 2-2 when White was able to reverse Mulkey to his back and hold for the fall and the state championship. White finishes his senior season with a 39-1 record. He becomes the third individual to win a state wrestling championship in NPHS history and won the program’s sixth state title. 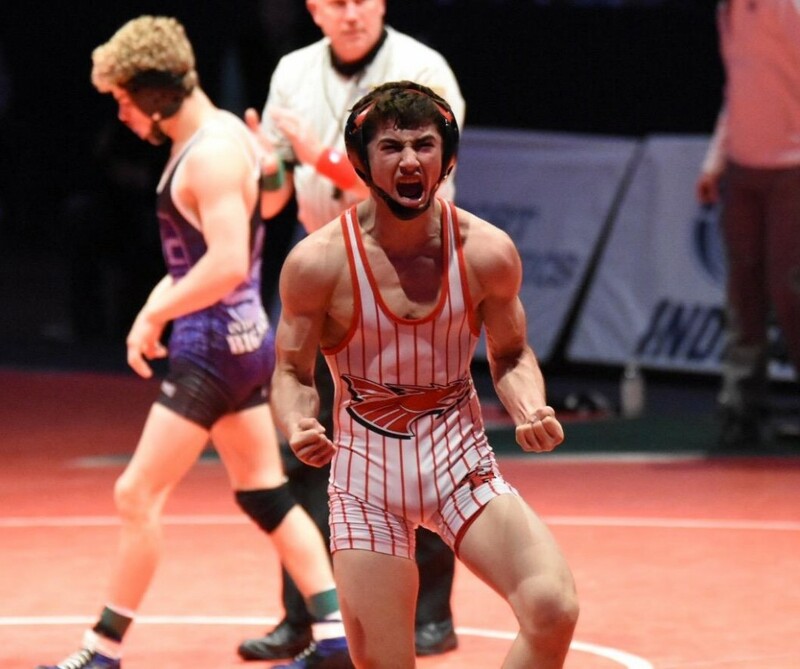 He joins Kyle Ulrey and four-time champion Chad Red as state champs. Earlier in the day, White matched up with previously-unbeaten Graham Rooks of Columbus East in the semifinals. White got the first takedown and led 2-1 after a period. In the second, he surrendered an early escape to Rooks, but then took him down late in the period and recorded a two-point near-fall to take a 6-2 edge. An escape to start the third ran his lead to 7-2. Rooks had two last-ditch takedowns in the closing seconds, but White clinched the spot in the state title match. 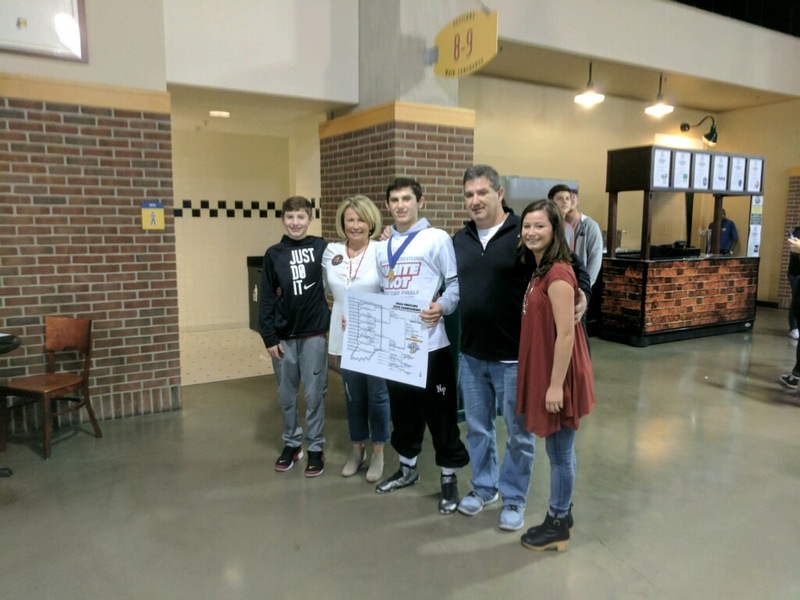 In the quarterfinals, he defeated Evansville Mater Dei’s Matt Lee 3-1 in Saturday’s quarterfinal round. He started the weekend with a 5-3 win over Lowell’s Colton Cummings in the opening round. 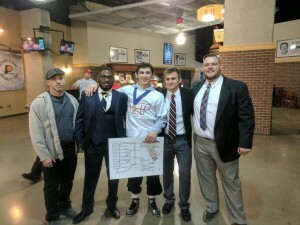 State champion Alec White (center) with the NPHS coaching staff, Clay Roan, Josh Franklin, Alex Johns and Willie Bryan. Alec White wrestling under the lights. 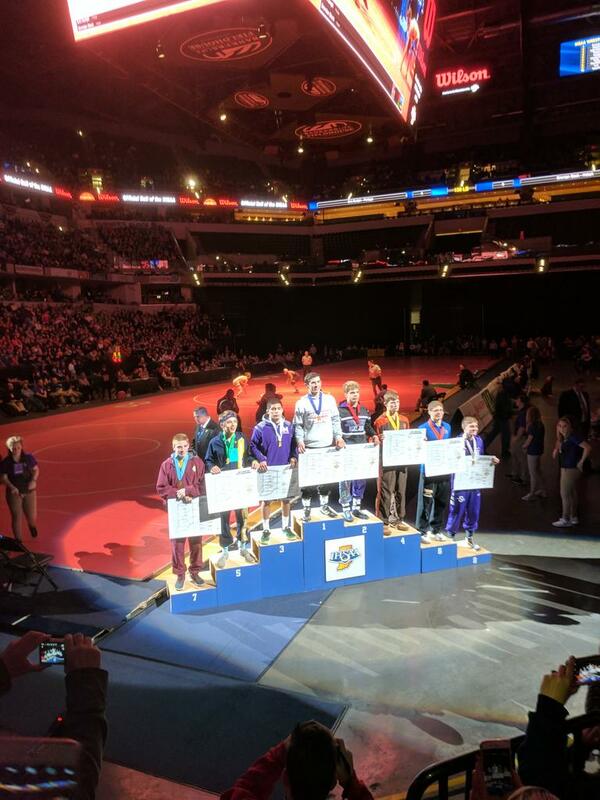 Alec White on the podium at Bankers Life Fieldhouse. Alec White celebrates his state title with his family.